The longer the distance of your triathlon, the more crucial it becomes that you waste as little energy as possible. Every triathlete has a love-hate relationship with air. You have to breathe it, but it’s an obstacle otherwise — especially on the bike, which is the longest portion of every triathlon. Catch the air like a kite, and you are in trouble; slip through the air like a knife, and you have mastered an essential element for triathlon performance. Even though you cannot see them, air molecules (a mixture of gases, mainly nitrogen and oxygen) are just like all other molecules inasmuch as they have mass and occupy space. Anything moving through air must push the molecules out of the way. The faster the object moves, the faster the air molecules are encountered and the greater are the number to be pushed aside. So for example, a car with a narrow or wedge-shaped front end and smooth, gentle curves will slip through the air more easily than a big and wide truck with a large, boxy, flat front end. In terms of the air that moves around the bicycle frame, the triathlon bike was created with additional aerodynamic features than a regular road bike. The frame geometry, aerobars, and wheel size are designed to aid the rider in maintaining an aerodynamic position, and to reduce wind resistance. On a triathlon bike, the shift levers are at the end of the aerobars and the brake levers are at the end of the handlebars. This is designed for racing efficiency; you do not have to come out of the aero position to shift. There are additional things you can do to reduce the drag caused by air traveling over your top and around your sides. First, invest in a good aerodynamic helmet. In recent years, time trial helmets (created specifically for time trial races, where time differences of seconds can separate the top finishers) have become increasingly popular among triathletes. 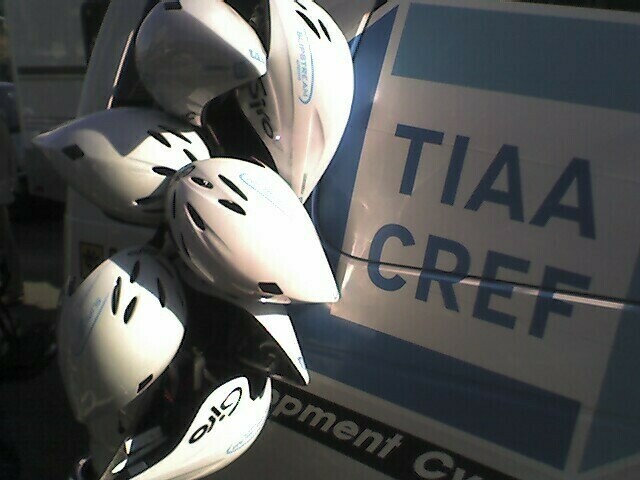 Testing results have shown that all aerodynamic helmets offer drag reduction over a standard road helmet. A triathlon bike, a time trial helmet – it can all add up fast financially. Every triathlete has to come to a determination of whether the added expense is justified by the benefits gained. One thing every triathlete can do — which costs nothing — is maintain the proper aerodynamic position on the bike. Aerobars (which can be added to a standard road bike) serve a vital purpose. Aero bars put you in a more aerodynamic position, which reduces wind resistance at higher speeds. They allow you to ride in a more restful position. However, that’s not to say that finding and maintaining the aerodynamic position is a piece of cake. It’s something you have to learn and practice. Be comfortable. Finding and achieving a position that is comfortable is critical because without comfort, regardless of how aerodynamic your position may be, you won’t stay in it. Work on flexibility and core strength. Your lack of comfort in the aerodynamic position may be symptomatic of low flexibility and core strength. Yet again, another reason for having both in your triathlon training plan. Look at the pictures. One easy way to figure out the proper aerodynamic position on the bike is to look at pictures of experienced triathletes who are in the aero position. Go to the experts. You might want to consider going to your local pro bike or multi-sports shop and have them help you find the proper aerodynamic position. The slightest bike adjustments, which they can do, often make a world of difference. Practice. Decide that you are going to ride in the aerodynamic position during a portion of every training ride. The more the better. Lose unnecessary weight. Okay, let’s be honest. Any extra and unnecessary weight isn’t helping matters on the bike, and may be adding some undue stress on your lower back when in the aero position. Educate yourself. Do much reading? Here’s one to consider, Zinn and the Art of Triathlon Bikes: Aerodynamics, Bike Fit, Speed Tuning, and Maintenance.